What is the best course of action to resolve this? Do I just assume Fan 1 has failed and replace it? If so how do I identify which is Fan 1? Fan 1 is shown below. What you need to do is try reseating the fan first to see if it may have been a poor connection. Many thanks for your response. I've just taken the fan out and reseated it but the problem is persisting. Therefore am I to assume it's failed, and how do I go about getting a replacement? Also is it normal for the other fans to speed up to compensate for the failed fan? Yes that is to ensure the server stays cool. 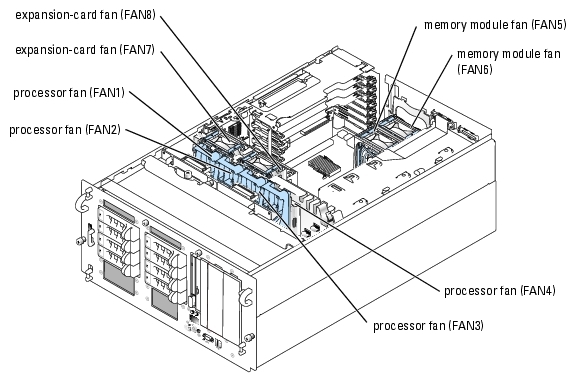 Do me a favor, would you swap fan #1 with fan #4 and see if it is the fan causing the issue or if it's the connection on the board? Hi Chris. I've swapped fan #1 with fan #4 and the LCD now reports an issue with fan #4, therefore I've managed to ascertain that the issue lies with the fan. How do I go about getting a replacement? I am going to email you with a request for some information.